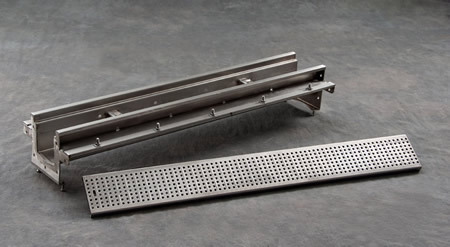 9665 - 6" Wide Modular Shallow Stainless Trench Drain System - Jay R. Smith MFG Co. Stainless steel trench drain channels shall be 39.38” long, 6.38” wide, and have a 4” wide throat with bolting end plates. The modular channel sections shall be made of 16-gauge type 304 stainless steel. Channels shall be non-sloping. Channels shall be available with invert of 3.18” Regularly furnished with secured light duty 9870-450-SS slotted stainless steel grate and 4” no-hub vertical outlet.